What Went Wrong When Google Shared Ranking Factors in the Past? First, let’s take a brief stroll through the past and what Google has learned about telling the world about ranking factors and how that information is “applied” in the world of SEO. Telling the world that links lead to better rankings in search results eventually helped create blackhat link building and Google having to crack down on link schemes. This has led to major penalties against sites suspected of buying and selling links, link exchanges, large-scale article marketing and guest posting with keyword-rich anchor text, automated link building, optimized anchor text used in press releases, low-quality directory links, etc. Telling the world that on-site keyword optimization of web pages would lead to better rankings in search results helped create spammy on-site optimization and Google having to crack down on keyword stuffing, hidden text, etc. Telling the world that having more content on their websites would lead to better rankings in search results helped create demand for content scrapers and Google having to crack down on scraped content and automated republishing of content from one-site to another. There are many more examples of ranking factors that have been used and abused that you can learn about through detailed study of how Google has fought them through updated Google Webmaster Guidelines, every major Google update (Panda, Penguin, Hummingbird, Pigeon, etc. ), and all of the things they fight through manual actions. Why Google Shares the Ranking Factors They Share Today, Including RankBrain? So now, if you notice, when Google shares a ranking factor, it’s something they want people to abuse. It sounds odd, at first. But think about it. Google has put a huge focus on mobile optimization lately, and they’ve let people know that if you want to rank well in mobile search, you need to make sure that your website is mobile optimized. 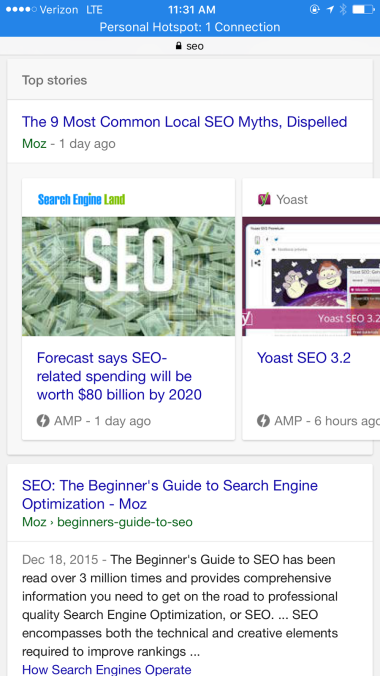 Between desktop and mobile results, the Yoast article only appears on mobile results, thanks to AMP. So you may not say that AMP is a ranking factor, but it is one that helped that site rank for mobile users for a pretty competitive keyword, in this industry at least. Page speed as a general search ranking factor. If websites are running faster, there’s no wrong from a user’s perspective. Responsive design as a mobile search ranking factor. If more websites load in a mobile-friendly design, there’s no wrong from a user’s perspective. Google AMP as a mobile search ranking factor. If more websites load instantly on mobile, there’s no wrong from a user’s perspective. How does this relate to RankBrain? It’s simple. RankBrain is a ranking factor that cannot be abused. It’s doing what all marketers should be doing. It’s learning from its audience (searchers) and constantly adapting to find the connections between what people search for and what people actually want. And ultimately, that’s what marketers should be doing. Creating website content that predicts what their audience wants. How SEOs can Incorporate RankBrain into Their SEO Strategy? So how does Google RankBrain affect SEO strategy in 2016 and how can SEOs incorporate RankBrain into their tactics? You can read about the ins and outs of machine learning and artificial intelligence (which is quite fascinating), or you can do this. You can start thinking beyond single keyword phrase optimization. Here’s what I mean. The whole point to RankBrain is to not be literal, keyword by keyword, but to take what a search user inputs into the Google search box and interpret what that searcher really means. So instead of creating pages and content that are focused on only one keyword phrase, create pages and content that are focused on one main keyword phrase and the phrases related to that keyword. For example, take something simple like a blog post on goals. In SEO past, you would do your keyword research, find that goal setting has 12,100 average monthly searches, and hammer out a short piece of content that really focused on that phrase. 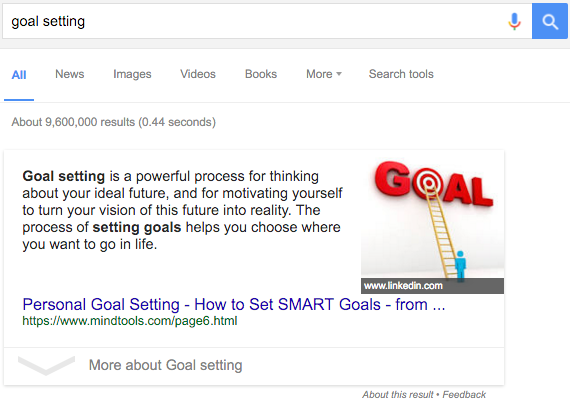 Then continue through other goal-related keyword phrases. If you want to appease RankBrain, here’s what you’d do differently. You’ll still do your keyword research. But instead of creating a short article that focuses just on goal setting, you’re going to create a complex piece of content that covers many aspects of goals, from goal setting to goal achievement. 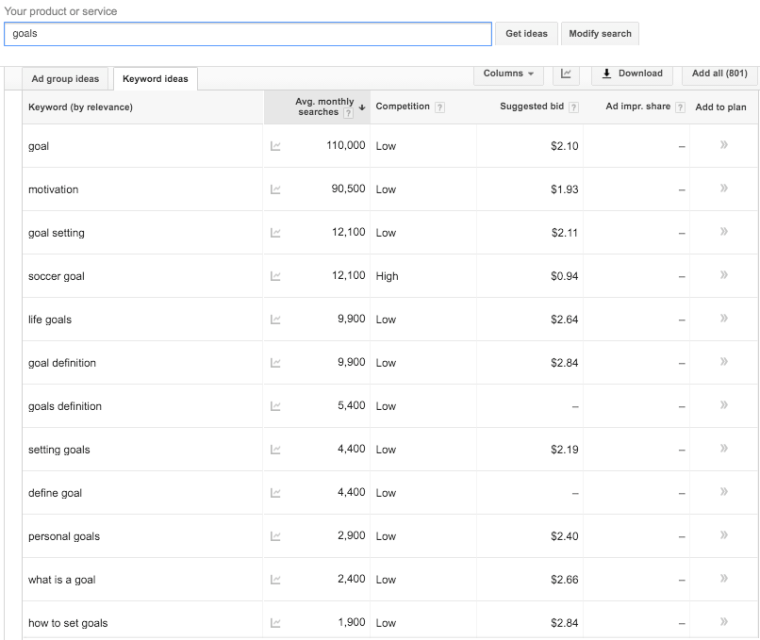 And you’ll get all the bullet points you need using your two favorite and free tools: Google AdWords Keyword Planner and Google Search itself. Here’s what it would look like in a step-by-step process. But start with it with a different frame of mind. You’re not looking for one keyword phrase for one page. You are looking for multiple keyword phrases for one page. When with the idea of a blog post on goals, you would be looking at the following. You could browse through the entire list or even download them all to a spreadsheet for further review. But what this list should reveal to you are multiple keyword phrases you can put in you blog post title as well as subheads that you could put throughout your blog post. 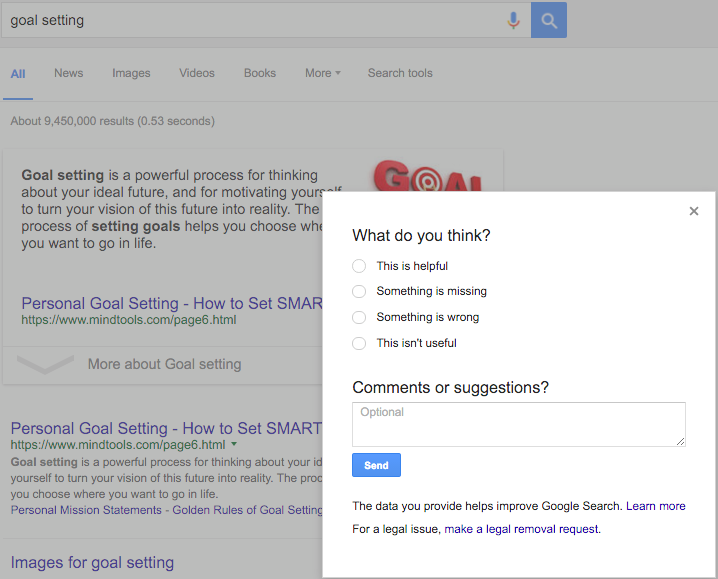 That way, no matter what someone was searching for about goals, your blog post would ultimately cover it. Once you’ve found some great keyword phrases for our blog post title and subheads, move on to Google search and actually search for those keyword phrases. At the bottom of the first page of search results, you will usually find some related search phrases for your original search. These are some additional keyword phrases that, if applicable to your content, you will want to gently pepper throughout your blog post. I’m not going to say that these “searches related” are RankBrain, but it could give you an idea as to what RankBrain relates to certain keyword phrases. In other words, it could help you get a little insight into RankBrain’s brain, so to speak. The point isn’t to use X keyword phrases X number of times. The point is to create a great piece of content that incorporates many different related keyword phrases a natural number of times that is easily readable and useful to audiences searching for any of those keyword phrases. So if you included goal setting, define goals, how to set goals, goal setting worksheet, etc., then make sure that each mention counts and is useful for the reader. Does it mean you need to create a goal setting worksheet or template if you mention both in your post? It depends. On one hand, you could link out to someone else’s while using the keyword phrases. But on the other hand, if you could have one that you’ve created yourself, not only will the reader get the value on your website, your page would be the one that others would link to with the keyword phrases of goal setting worksheet or goal setting template, which would be much more valuable. Ultimately, your content needs to pass the people seal of approval in order to be helpful to your website, your business, and your SEO. Why, you ask? Because in some cases, if you make it to the top of organic search results, Google may offer searchers the chance to give feedback about your web page’s content. The last thing you would want is to make it to the top of search results, only to be taken down by people who didn’t find your content that valuable to begin with. This is why it’s not about learning how machine language or artificial intelligence works, or looking for ways to manipulate as many ranking factors as possible. You need to be focused on what Google is focused on: providing the best content in search results for searchers. Once you’ve crafted your great piece of content on goals or whatever topic you are creating a web page for, make sure you look at the analytics that tell you how people view that content. Do people share it on social media? Do people leave favorable comments? Does it convert? Do people stay on the page? Do people visit more pages on your website? Don’t just focus on your rankings – focus on what happens after you get the clicks on your web page! RankBrain, like all other Google updates, is focused on quality for the end-user of Google: the people who search for information. If you, as an SEO or any other kind of marketer, can start focusing on what is best for the audience that you want coming to your website, then your goals will align with Google’s, and your results in Google search will start to improve as well. Screenshots by Aleh Barysevich. Taken April 2016.